In order to establish the direction of his investigations, Wrede traces the Messianic revelation of Jesus to the people according to the outline of Mark’s Gospel. Wrede poses the question, “Did Mark intend to represent the supposed development in Jesus messianic life, or did he describe it unconsciously and yet faithfully?” (14) Certain arguments have been made concerning Mark’s revealing Jesus as Messiah through Peter’s confession in 8:29. In establishing his own answer to this question, Wrede claims that “the narrative does not look like an intentional record of messianic development” (16) and follows this statement by making four positive points. First, Wrede observes that Jesus heals many sick people and follows their healing with a command for secrecy, but Jesus performs many miracles in the public’s view. Even when certain miracles were performed in private, those who were healed did not follow the command to keep their healing secret. Second, Wrede says that Jesus is revealing himself as Messiah to his confidants in the raising of Jairus’ daughter. According to Wrede, this story portrays Jesus doing everything he can to call forth the knowledge of his Messiahship for his confidants. Third, Wrede says that Jesus is calling himself “Son of Man” in 2:10 and 2:28. Wrede says, “If “Son of man means the Messiah, then according to Mark Jesus designated himself as such long before Peter’s confession, and in full glare of publicity at that.” (18) Fourth, Wrede observes Mark’s use of the “bridgroom” statement in 2:19-20. Wrede says that for Mark this statement necessarily has a messianic tone, and points out Mark’s use of this passage as a prophecy of the Passion. 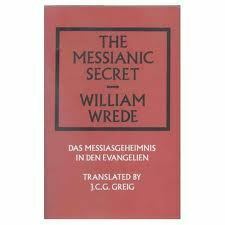 By making these points, Wrede establishes the basis for his investigation regarding the secrecy of Jesus’ Messiahship. The question posed by Wrede is whether or not Peter’s confession cancels the other reports that could be considered in Jesus’ self-proclamation or Jesus being proclaimed Messiah. Wrede follows with the conclusion that a thorough critical examination of Mark’s data is needed. Wrede argues the point that in Mark Jesus is recognized as the Messiah by the demons, but not by the demoniacs. (25) The demons, as supernatural spirits, recognize the supernatural spirit in Jesus. Wrede makes the observation that when Jesus confronts a demoniac he speaks to the demon and not to the person who is sick. However, Wrede does note the necessary presupposition that “the expectation of the Messiah was in the air.”(30) This could provide some clarity to each of the accounts concluding with the same judgment that Jesus is the Messiah. In this section, Wrede organizes Jesus’ prohibitions into five sections: prohibitions addressed to the demons, prohibitions following other miracles, prohibitions after Peter’s confession, intentional preservation of his incognito, and a prohibition to speak which did not originate with Jesus. Wrede argues for the extreme probability that the various commands in Mark share the same sense. He says, “The continuous repetition of the feature is by itself enough to press this upon one, but the lack of a motivation intensifies it.” (37) Wrede also argues that the two passages in which Jesus is incognito (7:24; 9:30) are related to the prohibition passages, because they indicate a preservation of the messianic secret. In this section Wrede notes that in the Gospel of Mark there are two closely related ideas: “(1) that Jesus spoke in parables, i.e. veiling his meaning to the people, but openly to the disciples, and (2) that the parables remained obscure to the people but were explained to the disciples.” (65) Wrede explains that, “the idea of the messianic secret goes beyond the miracles and the messianic apostrophes by demons or disciples.” (66) By using parables, Jesus concealed the meaning of the parables from the crowd and interpreted them to the disciples when Jesus was alone with them, however, the disciples did not always understand the interpretation that Jesus provided. Wrede illustrates the necessity of Jesus’ death from the start of Mark’s Gospel. “Jesus’ death, just like his resurrection, is a part, and an essential part, of his messianic work.” (83) According to Wrede, it is Mark’s view that Jesus makes his way to Jerusalem because that is where he wants to die. For Wrede this is how Mark’s community would have viewed Jesus’ death and Jesus’ approach to life. (84) Wrede clarifies this in saying that “without the resurrection the suffering and dying are inconceivable for an early Christian.” (85) Wrede portrays the prophecies of suffering as statements directed from Mark’s community of faith. This could be a clue that Mark’s community was experiencing persecution and suffering. Wrede refutes the idea that the disciples are somehow slowly coming to understand Jesus’ prophecy of his suffering through repetition. He notes that despite Jesus’ repetition of the prophecy the disciples arrive at no clearer understanding, and there is no attempt by Jesus to explain the prophecy to them. Wrede says, “Jesus speaks of his passion and resurrection in such plain language that it is incomprehensible how there should be anything incomprehensible in them!” (94) In a reference to Strauss, Wrede explains the disciples’ lack of understanding as if they were trying to understand a foreign language. “Nevertheless they hold on to it, one might also suppose, in order to preserve it for a time when understanding would dawn.” (94) Hence, understanding will come with Jesus’ resurrection. The messianic secret is an important virtue that the body of Christ ought to emulate. Looking at the larger picture, Jesus was a man who came on earth because of the mission to save mankind and not a single day did he ever forget that. He work on anything that would bring a diversion in his life and ministry. And for sure he accomplished the mission. The body of Christ has a mission and we are expected for nathing but to do do the mandate of God with great intelligence. We can also appreciate his level of humility, the Children of God should be humble in the ways of their conduct if they are to be effective in the mandate of the Gospel. The Messianic Secret is same thing we should emulate.